"Happy New Year everyone. I've made a new episode for Jamie TV all about the Line Doctor Pedal from Fret-King, which has been quite a revelation to me. I didn't know how much I needed it until I recorded this demo of how it works. It is however, an episode I only really recommend for pedal nerds and signal loss obsessives. You know who you are!" And in other news, "I'm currently working on a new covers band with some exceptional people. I can't say much about it yet, but it's all very exciting and I'll fill you in as soon as i'm allowed. :) There are many original recordings and collaborations in the works too that i'm really happy with. Time is my only enemy." Recently, Starbug Studios has been undergoing a few changes. There are two main reasons for this. 1st of all, Jamie was keen to re-launch his own YouTube channel - moving into making better quality videos and a lot more of them! "I've been making music for a long time, yet a lot of the people who have heard of me don't necessarily get where I'm coming from. I need to communicate better and I think video will really help me with that. So, Jamie TV will be about whatever is going on in my world, and most likely, what's happening in Starbug. So it might be a piece about a new riff I'm recording, a pedal I just bought, it could be a gear demo or just a vlog maybe, or a lesson etc.. etc.. I've also been having a move around in the studio to better facilitate doing Skype lessons. Basically, the Academy Of Rock is currently full, with a waiting list for a space. So, I think a way forward for me will be to begin teaching online, I'll be able to squeeze a few more in this way - teaching people overseas who are available when all my students are at work or at school." Additional, "I've worked harder than ever this year. More than ever before I've had to wear many different hats in order to stay in the game and make the sums work. Between teaching, setting up, repairing, modding, standing in for bands, jamming, being on the road with whoever wants me - playing bass, playing guitar...it has been exhausting but very rewarding. The new year will see releases of new tracks from me. Some solo stuff and some colaborative and more videos. But for now, I'd just like to wish everyone a very merry christmas. I hope you all have a great time and that life is being good to you. Take care and keep checking back for more Jamie stuff. Much love, and peace." Jamie, "I've been working for The Sharon Lewis Band now for over a year. Sharon has undoubtedly one of the finest voices on the planet and Craig and Lee are top notch. I have the upmost respect for them all both as musos and as people. It has been superb to work with decent people who also happen to be very talented. I haven't had a single cross word with any of them and consider them all good friends. However, during my tenure with the band, they have all been through changes in their lives away from music and they now wish to work less as a band than suits me. I'm still your old school gigging musician. All I think about is playing and performing and gear and I want to do it till I drop. So, with their blessing, I'm putting the word out there to see who might want to work with me. Interested parties can message me at jamiemal@hotmail.co.uk"
11.10.2013 - 13.10.2013 saw Jamie playing for the John Verity Band, filling in for their regular bass player. The band features of course Mr Verity himself and Bob Henrit - both men former members of Argent and Phoenix and indeed Bob Henrit was in The Kinks! Jamie seems to be full of it, "I Didn't sleep last night. It was so exciting to play with 2 such talented and experienced chaps who recorded some of my favourite tracks. I mean, I have quite a few of John's albums - so it was an honour. I know John and Bob from jamming with them a couple of times at the JHS Event in Garforth. They proved to be just as down to earth and lovely guys as I had been led to believe. They're both proper musos, exceptionally talented, with a wealth of experience and still a massive passion for what they do. It's so refreshing to work with people who've had that degree of success but still at the core of them is that love of music and performing. I just can't come down from it, I'm still buzzing. I do hope they ask me to work with them again sometime. It was awesome." Visit our photo album for pics and reviews of the gigs. October 12th - Electric Theatre in Barnsley. October 13th - Early Sunday gig at the Boot & Shoe, Ackworth. 17/11/13, Jamie got a call, asking him to play 5 gigs, with 2 guys he didn't know - beginning the very next day. The EarlyMac Band had 5 gigs booked, but at the very last minute had to cancel. The drummer, Mr Peter Tallent decided to honour the gigs with a thrown together last minute raw blues outfit. He called Paddy Maguire - (www.paddymaguire.com) who agreed to stand in on vocals and guitar and a mutual friend and astonishing bass player, Lincoln J Roth recommended that he call Jamie to stand in on bass. Jamie agreed and met up with the band the next evening at The Fox And Crown in Newark. So the 3 piece, who did not know each other previously and had never played together previously - performed a blistering set of raw blues jamming off the cuff - and the audience loved it. They also featured the lovely Jenna Hooson on guest vocals for a few songs - an incredible talent, not to be missed. And so, the next morning - the 3 of them travelled to The Netherlands and played 4 gigs on 4 consecutive nights. Jamie, "The whole thing was a mad rush and is a bit of a blurr in places. I'm so glad I did it though. Onstage I felt totally at ease with these guys and as though i intuitively knew what they were going to play without being told. Which is a good job, because they didn't have time to tell me! I really needed this experience. Stripping music right back to reality. 100% live music with feel, light and shade and a whole lot of jamming and challenging improvisation. I feel like I've spent the last few days playing music the way it was always intended to be played. A lot of this stuff is forgotten in today's marketplace. Music has become pidgeonholed, predictable and very, very plastic. The people of The Netherlands treated us brilliantly. They were so nice! And the audiences loved what we were doing. We'll definitely be going back. We might even put a rehearsal in before we go this time!" On 13th September 2013, Jamie received the brand new Espirit bass guitar from Fret-King. It is from their relatively new Black Label series and this is one of the first production models out of the box. We hear that he is thrilled with the instrument and has made a demo video with his thoughts about it - but the clip is yet to be edited due to the mad bass player suddenly dashing off to The Netherlands. Whilst we await the clip - here is a pic of Jamie taken by JRobert Germeraad at The Blues Cafe in Apeldoorn. Time for an update from Mr Mallender, "It's a very busy time right now. To stay in the game and continue making a living as a musician, I've had to diversify - to make the most of the skills I have. It would be nice just to go into my studio and write and record one album until it's finished and then move on to the next project, but unfortunately the bills have to be paid in the meantime - so i kind of wear several different hats every day. I've been doing guitar and bass set-ups and mods and repairs for some years by word of mouth, and recently I actually advertised that service for the first time and it's really taking off. Of course, I do that work for my Academy Of Rock students for a cut price. Speaking of which, I'm very busy teaching and am really enjoying that role. Many of my Academy Of Rock students are really promising and play in their own bands and write their own material which I help them record. Nothing gives me greater pleasure than to see them progress. I love to record their songs in Starbug Studios, which is another thing I do for them at a reduced rate. I do like to look after them. I take select jobs on, recording other people at Starbug too. I like people to e-mail me with the recording job they have in mind and then I consider it - the time it will take, when I can get it done and I quote a price for that specific job. There are no set prices at Starbug because every job is different and I like to be competitive and fair. I'm also still playing for The Sharon Lewis Band, which is a quality covers band that plays up and down the UK. Sharon is one of the finest singers in the business and Lee and Craig are excellent musicians. We all get along great and when you're on the road, that's the most important factor for me. That's why I love to play the local jam nights, because we have so much fun. I get to back all kinds of different players, of all standards and from many different areas of music. It's a challenge, a pleasure and it's laid-back fun. I spent too many years not having fun whilst pursuing a music career - but now I'm back to enjoying myself. Life is a process of learning and growing as a person and the problem with doing music for a living is that one can remain in a bit of a childish bubble. I'm far from perfect, but I'm not under any illusions that I'm special either. I just do what I love to the best of my ability and continually try to improve and surround myself with musicians that are both talented and decent people, that i can rely on and learn from. The business is on it's arse and it's tough out there. We need each other. We need to be good to each other, support each others endeavours and remember what's really important in life. Music is not a competition - its an artform and it's the entertainment business and as a people we should be a community - not rivals. The internet has caused many problems for the music business, yet at the same time, it has opened some doors. One thing I'm really enjoying doing right now, is online sessions. People send me tracks online, I record them some guitar or bass in Starbug, and send them the file back. They pay me by bank transfer or by paypal, and everyone's a winner. Bonus! When I'm not too busy doing one of the above, I'm writing and recording material of my own - for a future release, or for a couple of band projects I'm involved with. I'll leave talk of the bands for a later update when I can say more about them - but if you want to know more about my solo material and how it's progressing, I'd love it if you checked out my VLOG's. There's a link on the media page. Stay classy people. Be nice to each other and don't ever be afraid to drop me a line on facebook or twitter - or just e-mail jamiemal@hotmail.co.uk." On 15th April Jamie announced he was leaving the band Raven Lord due to creative differences. Jamie wanted everyone to know why he was leaving and that his reasons were sincere so he made the VLOG below. He says he felt that if people could see him and hear him talk about the situation then they would see he was genuine. He also went on to make another VLOG pondering the future and what may be in store next. We have asked Jamie if he will be continuing to make the VLOG's, he seemed pretty sure he would. 23.03.2013 Download "Perish" By Raven Lord free! Multinational heavy metallers RAVEN LORD celebrate their second anniversary. As a birthday present a gift is made to the fans and the supporters in the form of a new song called “Perish” as FREE DOWNLOAD. RAVEN LORD present their very first metal ballad and thank all their friends, fans, press and supporters who gave such a great momentum after the release of their debut album “Descent to the Underworld“. On the 2nd and 3rd of march, Jamie attended The London Bass Guitar Show. He was there in his capacity as a Fret-King/Vintage endorsee - demonstrating bass guitars available from the Fret-King, Vintage, Italia and Danelectro ranges and SNARK tuners. Also present, were Jamie's other endorsers - Hartke and Rotosound. Jamie, "I had an absolutely fantastic time. It was really inspiring to spend the weekend with other fat-string warriors, hopefully helping to sell the products that are an integral part of what I do and hopefully give the endorsers something back. There was some incredible talent on display and a great comraderie amongst all the musicians present. I'd like to extend my gratitude to Mr Gavin Coulson for taking me and looking after me, and also - Jason How, Dean Clarke, Gareth Underwood and Biscuit for being awesome." 01.02.2013 saw the release of "Descent To The Underworld," Raven Lord's debut release on Mausoleum Records. It's a worldwide release, available in any reputable music shop. Not only did Jamie play his Fret-King Black Label Perception 4+1 on every track, but he also co-wrote all the songs. The album is currently receiving rave reviews in the metal press and the band are currently lining up gigs for later this year. The band also immediately start work on the follow up. Jamie, "Last year was a year of constant kicks in the balls. Now I'm back with a great band, a great album and the year is off to a flying start. This is testimony to my attitude of never giving up and neve losing faith. We've worked damn hard on this record and it shows. This is a high quality record and the reception has been very exciting. I can't wait to get out there and play these monstorous tracks worldwide." The digital download version of the album will be available soon. Please note, the North American release date is not until 12th February and France - 6th March. Multinational Metal Behemoth RAVEN LORD have chosen Alessandro Duo (Voodoo Highway) as their keyboarder to complete the band. 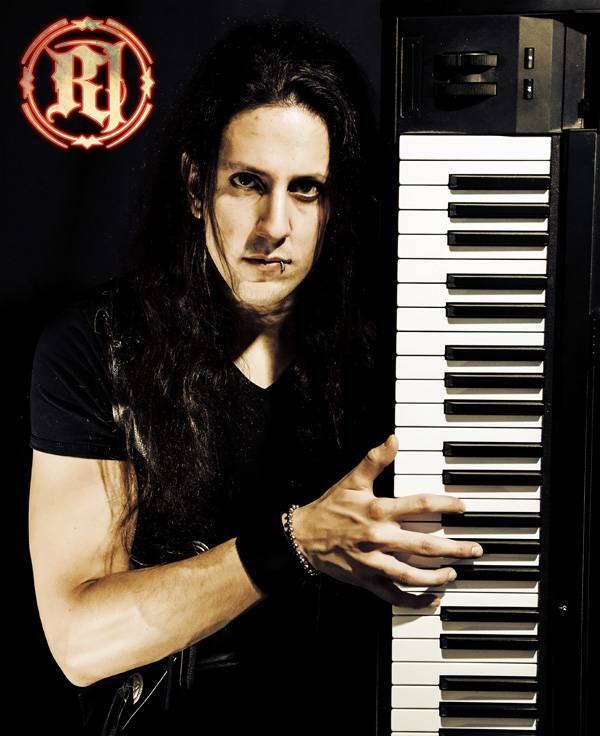 Italian born Alessandro Duo will be playing keyboards on all RAVEN LORD’s touring schedule in2013 as well as coming up future recordings. Raven Lord’s debut album “Descent to the Underworld” will be released on February 1st 2013 Worldwide except North America on February 12th 2013 and March 6th 2013 for France via Mausoleum Records. Are you the guru for graphical design and video editing? Have you ever wanted to produce and edit your video clip to your favourite music? Now this is your chance! RAVEN LORD just released the track “Black Friar” on which you can use your imagination and talent. You’re free to use animated or recorded video material. The resolution shall be HD quality. Make sure you use only video material on which you own the rights to! The winning contestant will be publicly announced in a press news and wins 300€ for the efforts. The video chosen will be the official music clip for the upcoming album release in January 2013. 2. Create your own video for “Black Friar” with your favourite tools. 3. Upload your HD video version to YouTube with the title “RAVEN LORD – video contest -” followed by your name or company and set the rights to unlisted! 4. Send your link to us promo (at) rockngrowl.com and you’re officially entered our contest. Contest ends on Monday, 31. December 2012. The winning clip will be chosen by the band. The winner will be contacted by ROCK N GROWL. Good luck! RAVEN LORD recently inked a two-album deal with Mausoleum Records. The group’s debut CD, “Descent To The Underworld“, is scheduled for a release on January 25, 2013 in Europe and February 12, 2013 in North America. The CD was mixed by acclaimed Swedish producer Fredrik Nordström (AT THE GATES, ARCH ENEMY, NIGHTRAGE, IN FLAMES, DREAM EVIL, OPETH) and mastered by US mastering engineer Maor Appelbaum (SEPULTURA, HALFORD, YNGWIE MALMSTEEN, ANGRA, DOKKEN). The cover artwork for the effort (see below) was made by Caio Caldas “CadiesArt“, who has previously worked with DORO, PAUL D’IANNO, SEVEN KINGDOMS, DOMINANZ and VIOLET SUN, among others. It's here!!!! The much anticipated Academy Of Rock!!!! A chance for all to benefit from Jamie's experience in the music business. The 1 to 1 guitar and bass lessons are of course still available but now there is so much more on offer. Check out the new page on this website for all the details! Multinational metallers RAVEN LORD haves announced the addition of guitarist Joe Stump (HOLYHELL, REIGN OF TERROR) to the group's ranks. "Joe Stump has quite a considerable catalogue of excellent solo releases under his belt — both instrumental and with REIGN OF TERROR,HOLYHELL and a long list of guest appearances. He is also a renowned guitar teacher with his own series of instructional releases available onShred Academy and brings to the band a wealth of touring experience. "RAVEN LORD sounded like an exciting prospect before, but now with Joeon board, things are shaping up to be a true force to be reckoned with and one can only await the release of their debut album with bated breath and sweaty little heavy metal hands." Added RAVEN LORD singer and founder Csaba Zvekan: "Knowing thatJoe Stump is in the band means a great deal to me as now RAVEN LORDhas a strong foundation for the future as well as for touring and for future recordings. Joe's playing is stunning and with him in our ranks we step up to another level. They don't call him the 'shredlord' for nothing." Stated Stump: "I was recently approached by Csaba Zvekan and theRAVEN LORD guys about the possibility of joining the ranks. Needless to say, after hearing Csaba's voice, as well as the the sound of the band, I was sold. I've been at this a very long time and I know quality metal when I hear it. Looking forward to working with the fellas and, of course, bringing some serious over the top shredding and fierce metal riffage toRAVEN LORD." RAVEN LORD recently tapped Fredrik Nordström of Studio Fredman in Gothenburg, Sweden to mix their album. Nordström is a well-known producer and sound engineer who has previously worked with such acts asAT THE GATES, ARCH ENEMY, NIGHTRAGE, IN FLAMES, DREAM EVILand OPETH. The CD mixdown will take place the last week of August. Multinational metallers Raven Lord reveal that Fredrik Nordström with his Fredman Studios in Gothenburg, Sweden has been chosen for the final mix down for the new Raven Lord album. Nordström is a well know producer and sound engineer working with acts like At The Gates, Arch Enemy, Nightrage, In Flames, Dream Evil, Opeth and many more. “We were looking for the best of the best to give our debut product the final mix it deserves”, comments Csaba Zvekan to this collaboration. The studio mix down dates have been set to the fourth week of August. You can expect a killer mix with some behind the scenes videos and killer pictures. RAVEN LORD are rapidly gaining a reputation for being the most exciting new Heavy Metal band on the planet. Unashamedly wearing their heavy metal roots on their leather studded sleeves, RAVEN LORD combine the classic metal feel of the past with a modern edge of the present. Thunderous bass lines, pounding drums with razor sharp riffs blend with distinct heavy, melodic vocals to create powerful and memorable songs. The music that RAVEN LORD brings to you simply stuns – no pretensions – just hell of a metal entertainment. ANTHEM are no longer a managed duo. The pair have decided that they prefer to take their own bookings and make their own decisions about their future. For booking information, please contact jamiemal@hotmail.co.uk and for further ANTHEM information, or to see the brand new promo videos, check out the ANTHEM Duo page of this website and also the Media section. Jamie is now in posession of 2 new Fret-King Black Label Basses, The 4 string Perception, and Fret-King's very first 5 string bass - the Black Label Perception 4+1. Jamie is thrilled with the instruments. More information on the Gear page. ANTHEM have now been out working for 1 month, and for a new act, what a very busy and successful month it has been. The duo are going down a storm with audiences and are receiving glowing reviews. The pressure was on when ANTHEM hit the road, these are very difficult times in which to fill a diary and with both members having a great track record and a wealth of experience in the business, expectations were high. It seems however, that even though their hard work has clearly paid off, they haven't taken a moment to relax. The PA system has just been upgraded, a promo video shoot has been organised, a photoshoot booked, an album is well on its way, new tracks are being recorded to make the set even more crowd-pleasing and new lighting is planned. Jamie is extremely pleased with both his choice of singer and agent, "Kay has done what I expect of everyone in this business but they seldom deliver, she learns her stuff at home, turns up on time and delivers the goods in a totally professional manner. The audience love her and she's very easy to get on with. Our agent, Wass Massaad is right behind us, and I hope he's as happy with us as we are with him." To book ANTHEM, call Wass at WM-Pro - 01274 589854. Jamie, "Ok people, here's a thoughtful little blog for you. Just a little thought for musicians to ponder: We spend a lot of time slagging off the industry, but if we can't treat our fellow players with respect, love and honour, then are we not part of the problem? We should be helping one another, not competing - we should replace the bitchyness with positivity. We're in it together and it's tough enough without hurting each other. Being a musician will give you the greatest of highs, it will break your heart many times, almost certainly leave you flat broke at some time or other and could just make you rich in many different fulfilling ways. But whether or not this profession can truly make you happy is down to you and your own mental attitude. Because being a musician is a funny job. I've said all along that it doesn't matter how talented you are, it's about the hard work at home, the work behind the scenes that nobody sees. It's about trying ones best to know each and every aspect of ones craft, staying up all night to learn new material note for note in time for the next rehearsal, servicing gear and thinking the whole show over in one's head... constantly. You can't ever cover every base, there's always something else to do - and you've got to keep on going even when the outlook is bleak. You can moan about the state of the industry all you like, that's not going to put food on the table. Turn your anger and frustration into something positive because the only thing that gets rewarded in this business is hard work. If you see the music industry as a cut-throat career and do nothing but look after your own interests on the way up, dumping on people as you go - you're in for a very hard fall some day, and no-one will be there to help you back on your feet. It's called Karma, and it's gonna get you." On Wednesday this week, Anthem became a managed act. The duo will be represented by Wassef Masaad at WM-Pro Entertainment Agency. Wassef is a musician himself and has many years experience treading the boards as a well respected guitarist and drummer. Jamie, "I'm delighted that we have secured representation, so that now I can return to concentrating on being a musician and leave the bookings to someone who is an expert in that field. It was very rewarding to perform for such a well respected agent and to see how impressed he was. The duo is good, but the more we work the more we will improve, and Wassef could see the potential. I like to hear feedback from well informed people and wassef had a good few ideas about ways in which we could develop the show. I'm over the moon right now and I look forward to a fruitful relationship with the WM-Pro Agency. I have to give credit where it's due, when we went to perform for Wassef, Kay really pulled it out of the bag - she was brilliant." Anthem poster and page to be updated soon. Jamie's Mini Blog. "On 2nd Feb (groundhog day - again) I turned 40. I don't feel particularly different, but it does sound like a bloody big number to me! Some musicians I know have retired at 40, and many never made it to that age - getting disillusioned with the industry and packing it in to go do something a little safer. I always wondered how I'd feel about staying in the game at this sort of age, but I can tell you that I play better than I ever did. I'm a better person, and a better musician for all the experiences I've had. In a way I feel like I'm only just getting started. There are so many musical avenues I want to explore and ideas I have in mind. I've always tried to improve as a musician and I still have much to learn. So hopefully I won't suffer too much from this aging process we all have to deal with. I don't really feel any different, and I'm pretty healthy - I just maybe need the odd nap here and there!" "My birthday itself was one of the best days of my life. I have to thank my family, but most of all my Mrs. Donna went to an absolutely ridiculous amount of trouble to make my birthday a special day and it was very much appreciated. My main present was a Vintage VE900 MH Electro Acoustic. The whole thing is mahogany with rosewood fretboard and bridge. It's a "flat" finish rather than a shiny finish which I'm very much a fan of. The guitar really rings out acoustically, it's a big sound - bright, full and sweet. Plugged in this guitar really works for me. Lets just say that some electro-acoustics sound beautiful plugged in but get lost if you use them with a band. This one will have the rest of the band turning up!" Pics to be added to website soon. Jamie, "I've often been tempted to have a blog somewhere. But I keep reaching the conclusion that one can be too wordy, and I want to avoid feeling like I "have" to say something, rather than simply muttering when I actually have something worth saying. So, as it's the start of a new year, i'll have a bash at it and see how it goes. First of all, happy new year to you all. It's not something I celebrate, but the wishes are sincere. I hope you had as good a christmas as I did, if its something you celebrate, and if not - I hope you had a smashing time anyway! See, this is why i really shouldn't become a blogger. I have to say that I'm quite sad that EPIC has come to an end. I had always wanted to be in a totally live 3 piece band as I thought it would be good for my playing. The 3 piece situation means the bass player really has to work to fill some space, between the drums and guitar. It makes you think hard and play hard and I like nothing better than being challenged by a new musical situation. I thrived on the challenge and the audience reactions would indicate to me that we made a good job of it as a unit and we were rightly proud of it. I'd like to wish Eric and Steve all the best for future endeavours and to thank all the agents, supporters and bookers that helped us along the way. And so to my next musical challenge. Kay and I are almost ready to begin work as a duo. Most of the songs are finished. I've made most of the backing tracks myself (in Starbug Studios of course) which has been a hard but I think worthwhile slog. This outfit will see me playing a lot more guitar than bass, which means I'm now practicing very very hard on the Fret-King Ventura Super 60 HB3. Most of the parts are coming together ok for me, but there's the odd niggly bit here and there that is really doing my head in! Kay has been a diamond. I don't really know her very well, but she works hard learning the material at home and her voice is staggering. What more could I ask for? A huge thank you goes out to Mr Steve O'Brien for the recommendation. As the world seems to become a tougher and tougher place to survive in, and things are certainly not improving in the music industry, I am moved to thank the people who have helped me and supported me in recent years. In particular, Gavin Coulson and the other members of staff at John Hornby Skewes, Larry Hartke, the Rotosound guys - Jason, Coral and Steve, Adrian Bece, Joe Siegler, Jason Houston, Carl Taylor and Neil Tomlinson. Thank you to anyone who came to a gig, anyone that purchased something I played on and please, please, please, don't stop caring about real music. We're up against it more than ever - it's going to be a tough one! Much love."